Considering Capcom’s long-running Monster Hunter series hasn’t had much of an impact in the west, save perhaps for mild success on 3DS, this latest iteration generated a surprising amount of excitement prior to release. Curiously, it wasn’t just the fans who were thrilled to see a current-gen Monster Hunter game – something a long time coming – but also those who had always admired the series from afar. This is the entry Capcom hopes will push the series into the big leagues, achieving mainstream success by breaking down barriers to allow for an accessible experience. The draw, of course, being the ability to team up with online chums to track and take down colossal primaeval beasts, using a huge variety of weapons, poisons, and traps. 2K Games tried to tap into this ethos in 2015 with the quickly forgotten Evolve. 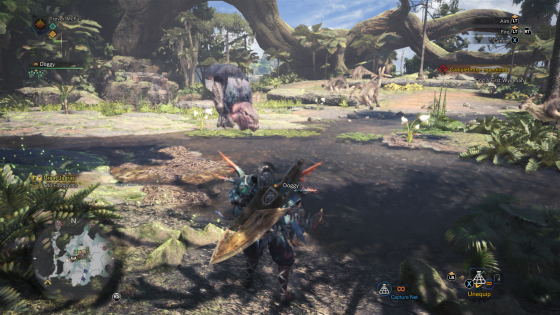 Although there are similarities, especially when it comes to tracking down and chasing after creatures, MH: W achieves more than Turtle Rock could have ever imagined. A living, breathing, vivid world full of rampaging monsters, with a deep crafting system, a lively online hub and a remarkably long list of quests and other busywork to ensure 50 hours of play at the very minimum. The whole thing centres around a carefully woven gameplay loop. Prepping for adventure with a hearty stat-boosting meal, taking down colossal beasts or completing side-quests, crafting new weapons and armour from the fruits of your labour, and repeating the process ad infinitum. With every passing quest, the unfolding story – which entails charting a new, unfamiliar, world – throws a new beast or two into the mix, putting the focus on upgrading equipment to deal with the next threat, be it a poison-spewing bird-brained foe, or a screen-filling giant that would make a tyrannosaurus rex whimper. 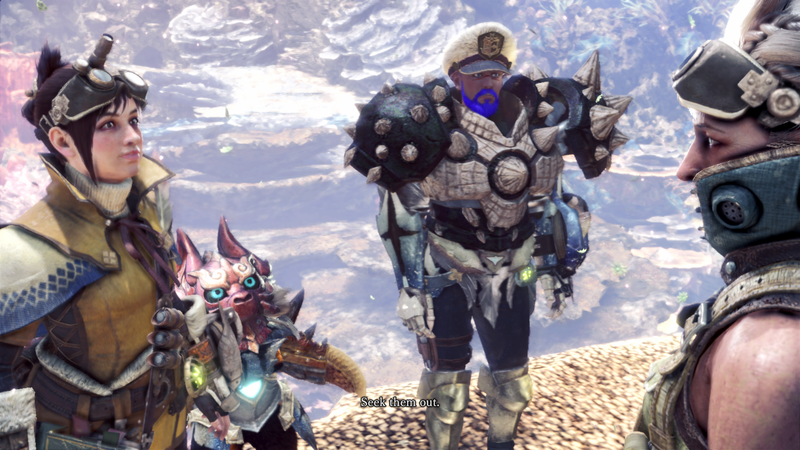 You aren’t alone in this pursuit either, joined by a feline friend known as a Palico. As well as collecting scraps and dealing a small amount of damage to enemies, they can also be commanded to place health stations. There’s no finer hunter than an inquisitive cat. The opening mission takes you through a hunt, holding your hand as it were, while explaining the basics in fine detail – video tutorials exist for almost every feature, big or small. You’re then left to forge your own destiny, all the while discovering hidden features and time-saving techniques. Experimenting with the 14 different weapons (basic versions of each can be found in storage) is also encouraged from the outset, giving an early heads up to the complexities and differences of each. Think along the lines of becoming well-acquainted with a beat’em up character. Getting your head around the online functionality is the biggest headache. From notice boards dotted around the mountain-side HQ, quests can be posted for others in your session to join. It sounds simple enough, but there are numerous ways to host, create, matchmake, and join sessions, along with the ability to communicate with gestures, stickers, pre-formed sentences, and traditional keyboard input. Handily, these can be assigned to the radial menu, so during the heat of battle, only a push on the d-pad is needed to give orders. The number of available quests soon swells as almost every NPC in the hub – be it biologists or the humble smithy – requests a hand at some point. On-the-fly bounties and deliveries can be picked up too, mostly involving hunting smaller creatures or gathering certain items. Again, it takes some time to learn the differences in quest types – some are one-shot only, and can’t be completed again, while others can be replayed. For all the explorers out there, it’s also possible to partake on expeditions and take things in at your own pace. There’s certainly scope for exploration and discovery, making the standard 50-minute mission length fly by. The great outdoors is precisely that. Huge, multi-floored wildernesses with caves, shorelines, mountain tops, rushing rivers, underground caverns, and scalable treetops. There are fish to catch, insects to collect, and a cubic tonne of items to forage. They all serve a purpose, used to make potions, antidotes, buffs, traps, ammo for firearms, and more. Felled monsters provide the real goods, however – items that can forged into new sets of armour and stronger weapons. 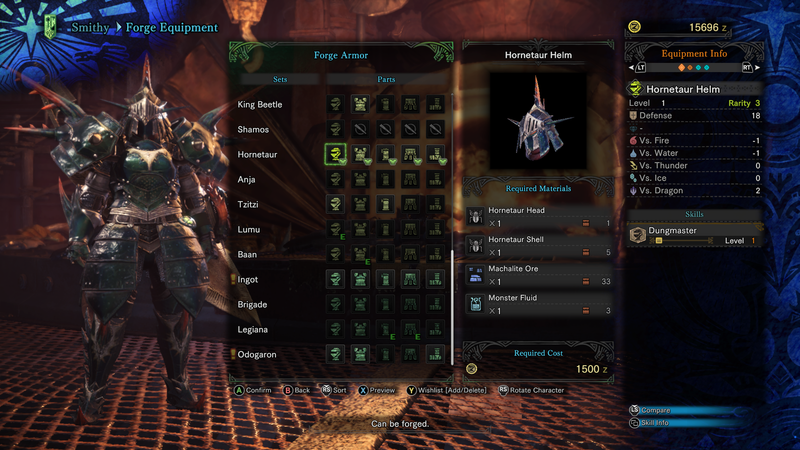 It’s fascinating how monster parts are woven into their respective armour sets, with tusks, horns, bones and more still distinguishable from the creature from which they came. Bragging rights come naturally – the HQ acts as an impromptu catwalk, allowing skilled hunts to show off their spoils of war. Palicos can also be kitted out in new attire, many of which veer on the adorable side. The difficulty level isn’t too tough initially. In fact, even some 25 hours in it’s still possible to take down huge beasts on your lonesome. If things do become too tough, it’s possible to fire off an SOS beacon to summon random online players. The real struggle comes when hunting in packs, as the difficulty level adjusts depending on player count. Preparation and planning are key – only a fool heads into a stomping ground with little to no consumables. It’s also wise to use environments to your advantage, luring beasts into areas with vines or raised platforms that can be leapt off, mounting foes with an aerial attack. Critical hits are devastating, making it even that more rewarding when a heavy blow finds its target. Taking down, or capturing, a monster takes considerable time and effort. Hunts generally have three stages, with monsters relocating to new areas on the map. While they don’t evolve, as such, they can gain new attacks over time. In lieu of a health bar other telling signs of weakness are used such as scars, wounds and limps. Wounded monsters tend to retreat to their lair or nest for a final last stand. That glorious final blow is then yours to savour on the mission complete screen, along with a rundown of rewards. Those expecting the fluidity of something like Bayonetta are in for a disappointment – the combat system is based on timing, striking at appropriate opportunities, and unleashing charged attacks at the right moment. Swords, axes, dual blades, and hammers aren’t too complex to master – a list of possible attacks is always shown on screen, a la Dragon’s Dogma – but hunting horns (metal bagpipes, anyone? ), gunlances, and switch axes call for experimentation. There are also insect glaives to consider – metal rods with summonable insects, which can be bred and raised back at HQ. 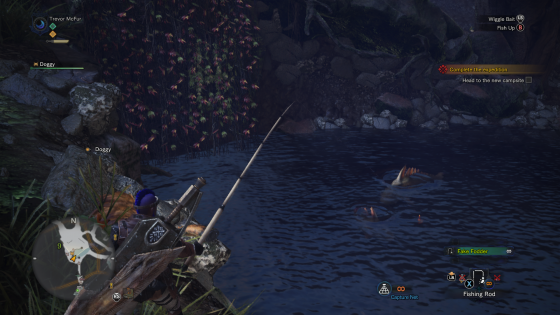 Much of Monster Hunter: World’s beauty and appeal lies in the careful balancing of the quests. It gently rises you up the food chain, gradually introducing monsters that can cast icy chills and other elemental attacks. Crafting materials are bountiful, providing the tools to succeed – it’s genuinely refreshing to play something that doesn’t hold back the goods from players, rarely prompting forced grinding. Throw in dozens of unexpected moments, such as landslides, sinkholes, turf wars and surprise encounters with new creatures, and you’re presented with a game that constantly amazes, and – most importantly – gives something back to players. This is ‘games as a service’ (for want of a catcher term) done correctly, and we sincerely hope other developers and publishers take note. What a wonderful world.